Former Labour leader Michael Foot has added to the tributes to Gwynfor Evans, Plaid Cymru's first MP, as details of his funeral were announced. 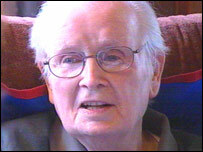 The veteran Welsh language campaigner and former Plaid Cymru president died on Thursday aged 92. 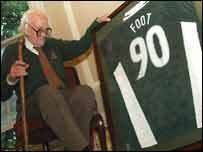 Mr Foot, 91, said: "He was the best ever advocate for decent Welsh nationalism. He put the case better than anyone I knew". The funeral will be on Wednesday at Seion Chapel, Aberystwyth at 1330 BST. Mr Foot, who was MP for Ebbw Vale and then Blaenau Gwent from 1960-92, campaigned unsuccessfully with Mr Evans for Welsh devolution in 1979. He said: "I was so sorry that we were unable to carry through the devolution vote in 1979 but at the time I was given consolation by his great Welsh humour. "I'm so sorry he's no longer with us". Politicians from all parties in Wales were quick to pay tribute to Mr Evans following his death on Thursday morning after a long illness. His passing was also marked in the Scottish Parliament, on the same day as the Gaelic Language Bill was being passed, which gave Scots Gaelic "equal respect" with English. Scottish National Party MSP Fiona Hyslop said he had played a "vital role" in campaigning for Gaelic. The Archbishop of Wales, Dr Barry Morgan, praised Mr Evans, a committed Christian and pacifist, for his "significant contribution" to Welsh life. "Gwynfor Evans did as much as anyone to shape the political, religious and civil life of Wales during the twentieth century," he said. "Underpinning his whole life was a commitment not just to pacifism but also, above all else, to the cause of Christ's gospel. "He lived out those principles in his everyday life and particularly in his dealings with his fellow humans. "As the title of one his books suggests, Gwynfor Evans never stopped 'Fighting for Wales,' but his fight was always gentlemanly and courteous, but determined - traits which are not always evident in today's political landscape." Welsh historian Lord Kenneth O Morgan called Mr Evans a man of "great significance, great dignity, great distinction". "He was a cultural nationalist primarily. He began by affirming the Welsh culture and Welsh language... but he was able to broaden its appeal," he added. Former Plaid Cymru MP and AM, Cynog Dafis, said of his former party president: "I believed very strongly there was no use in making enemies. "What you had to do was tread the common ground between you and the person you were addressing - and the common ground was Wales. "What Gwynfor did was lead the party through the transition from being a smaller cultural group to being a political party, and he had the moral authority to do that. "He was determined that Plaid Cymru must embrace the whole of the nation [including English-speaking Wales]." 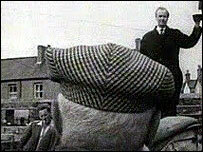 Gwynfor Evans was born in Barry, south Wales, in 1912, but spent most of his life in Llangadog, Carmarthenshire. Educated at the University of Wales, Aberystwyth, and then St John's College Oxford, he established a branch of Plaid Cymru while he was a student. In the 1950s, he fought but failed to establish a parliament for Wales. There was further defeat in his campaign to prevent Liverpool City Council flooding the Welsh-speaking Tryweryn valley near Bala to create a reservoir. In July 1966, he won the by-election in Carmarthen, called following the death of Labour MP, Dame Megan Lloyd George, the daughter of former Prime Minister David Lloyd George. Three years later, Mr Evans lost his seat to Labour, but he returned to Westminster in 1974 and remained there until 1979. He began a hunger strike in 1980, saying he would fast to death if the then Conservative government would not agree to found a Welsh language television station. S4C was set up in 1982. He wrote a number of books in both Welsh and English about Wales, his latest in 2001, Cymru o Hud in Welsh and Eternal Wales in English.